Enlightening (Residential Lighting Blog): Learn how to adjust your lights, shades and temperature from Anywhere! Learn how to adjust your lights, shades and temperature from Anywhere! 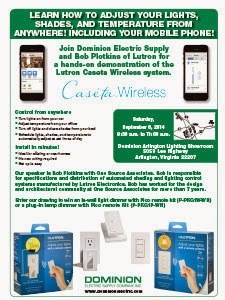 Join Dominion Electric Supply's Arlington Lighting Showroom and Bob Plotkins of Lutron for a hands-on demonstration of the Lutron Caseta Wireless system.